Farmer Bob's oven was busy over the three-day holiday. For Presidents' Day, he made a cherry pie on Sunday in honor of George Washington (not) cutting down the cherry tree. 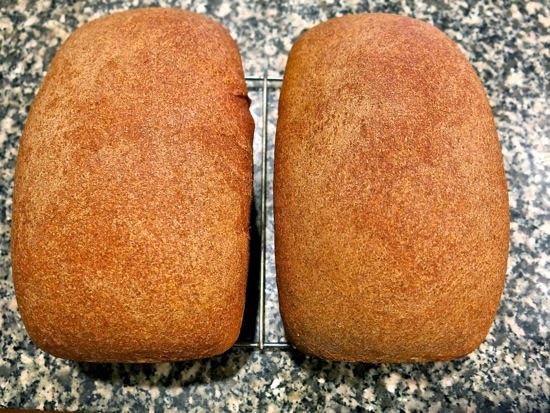 The next day, he tackled a new bread recipe, this one for Basic Whole Wheat Bread -- ideal for making sandwiches. As you can see from the photo above, the two loaves look almost award-winning (Bob thought they looked like a set of lungs!). And I have to say, the bread is equally tasty. I enjoyed some with dinner that evening and again the next morning. Fortunately, he took the second loaf into work, so I won't be tempted to keep sawing off slices throughout the day. Pour water into bowl of a standing mixer and sprinkle yeast over top. Let stand for a few minutes until yeast has dissolved. Stir in milk, honey and oil. Add two cups all-purpose flour and salt, stir to combine ingredients. Add rest of all-purpose and whole wheat flours. Stir to form a shaggy dough. Let stand for 20 minutes to give flour time to absorb the liquid. Using the dough hook attachment on a standing mixer, knead dough for 8-9 minutes. Alternatively, knead dough by hand against the counter. If dough is bubble-gum sticky against the sides of the bowl or counter add extra flour one tablespoon at a time, until it's no longer sticky. The dough is kneaded when it's smooth, feels slightly tacky, forms a ball without sagging and springs back when poked. Clean out the mixing bowl and film it with a little oil. Form the dough into a ball and turn it in the bowl to coat it with oil. Cover the bowl and let dough rise in a warm spot until nearly doubled in bulk -- about 60-90 minutes. This dough won't double quite as dramatically as other recipes, but the dough should look visibly puffed. Grease two loaf pans or film them with non-stick cooking spray. 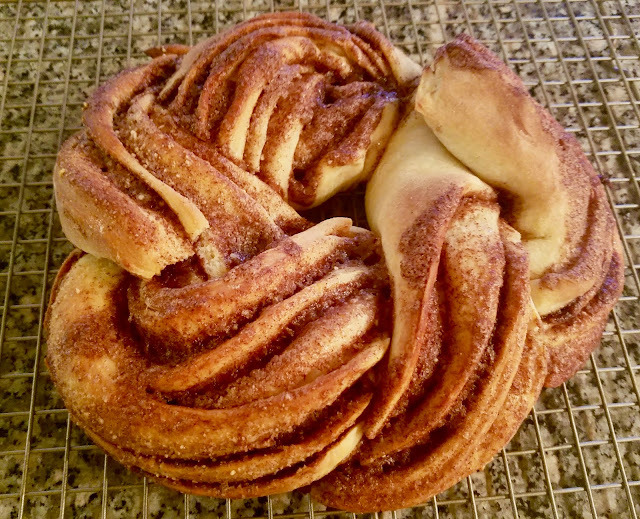 Shape each ball of dough into a loaf (see this tutorial for step-by-step instructions) and transfer to the loaf pans. It's important that the surface of the loaves be stretched taut; this helps them rise and prevents an overly-dense interior. Let loaves rise a second time until they start to dome over the edge of the pan, 30-40 minutes. Heat oven to 425F about halfway through the second rise. Slash tops of loaves with a serrated knife and put them in the oven. Immediately turn down the heat to 375F and bake 30-35 minutes. Finished loaves will be dark golden-brown and sound hollow when tapped on the bottom. Remove loaves from pans and let cool completely before slicing.